From Ulatis Creek in Vacaville we drove west to Suisun Creek near Fairfield. I was planning to photograph the Suisun Valley Road Bridge (23C0077), which is another of F.A. Steiger's reinforced concrete arch structures. However, I was disappointed when I got to the site and found a brand new single span box girder bridge across Suisun Creek. I did some research when I got home and found that the old bridge had been removed as part of the widening of Suisun Valley Road. 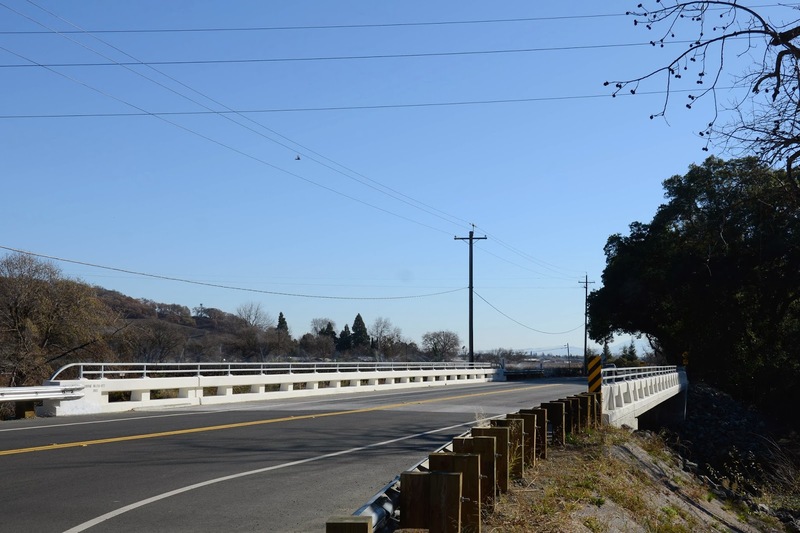 An article in the Fairfield-Suisun Daily Republic said that the plaque at the far end of each barrier rail on the old bridge would be left in place and that the new bridge would retain the old bridge's 'country look,' none of which was true. I was surprised that the old bridge, which was eligible for the National Register of Historic Places, could be demolished without even putting a report into the Library of Congress. Perhaps because it was eligible but hadn't been registered, it could be removed with impunity. Readers wishing to see the old bridge can go to the Bridgehunter Website where there are several nice photos by Craig Philpott taken in 2010.